I am all into Organic and homemade skincare products these days and trust me guys my skin is thanking me for making that transition. I stopped using those chemically laden face washes last year and since then I have been using homemade cleansing grains for my face and I am probably having the best skin ever. 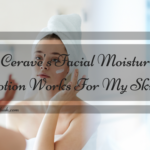 My skin feels so soft, clear and so much radiant after using the cleansing grains and it’s probably the best decision I could have ever made for my skin. 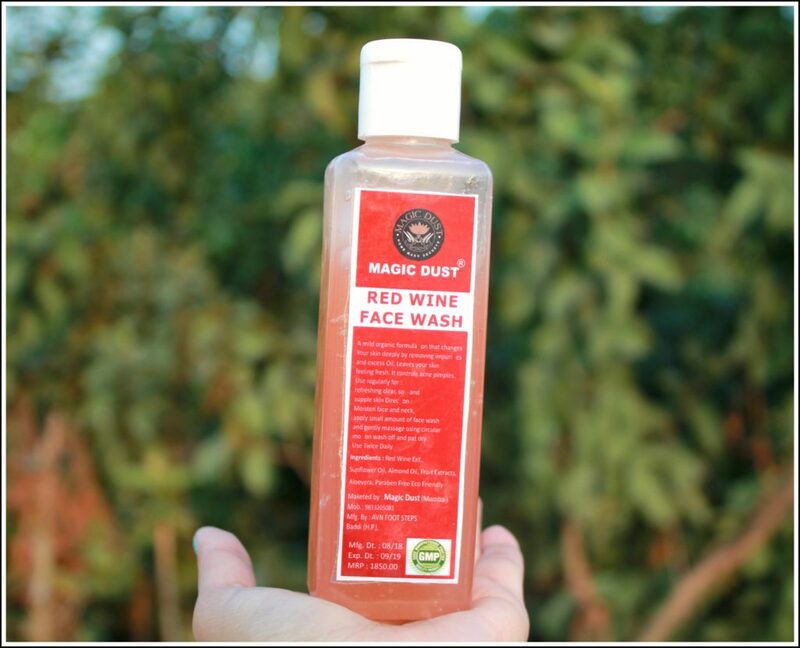 Last month Magic Dust sent over their Red Wine Face Wash to me, I was a bit skeptical about using it on my face as I had stopped using any sort of face wash but once I received it and saw the ingredient list, read about the organic and natural skin care products that Magic Dust makes I thought of giving it a shot. 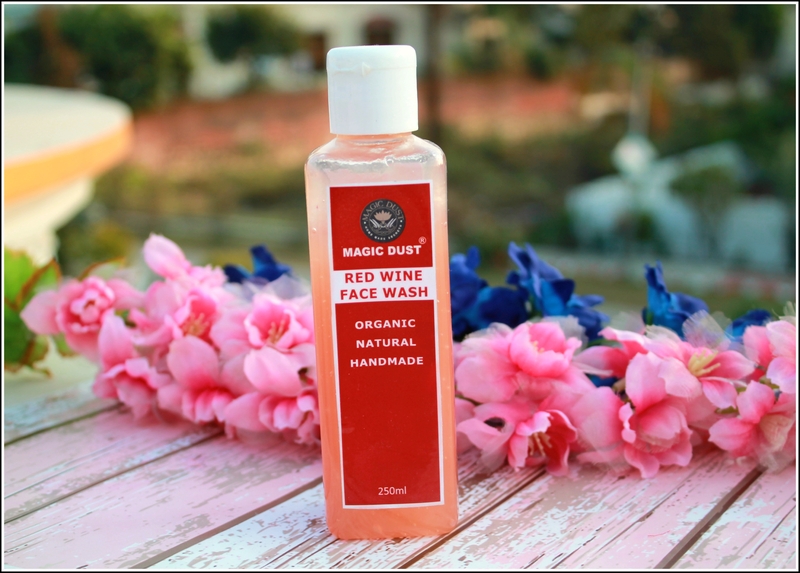 I have been using it for a month now and I think this is the right time to give you guys an in-depth review of the Magic Dust Red Wine Face Wash.
With the exclusive range of 100% natural products that are an amalgamation of unique organic ingredients and luxury, the brand has the vision of creating an organic skincare product line that ensures long-term vitality and helps individuals restore their natural youthfulness. Magic Dust specializes in luxurious organic skin care and hair care products. 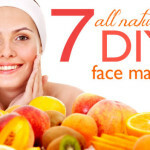 Their range includes the best natural skin care products, organic hair care products and body washes. 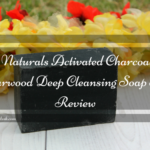 They offer 100% natural, non-toxic and paraben-free organic hand-crafted products that are environment-friendly. All skin types and ageing skin. 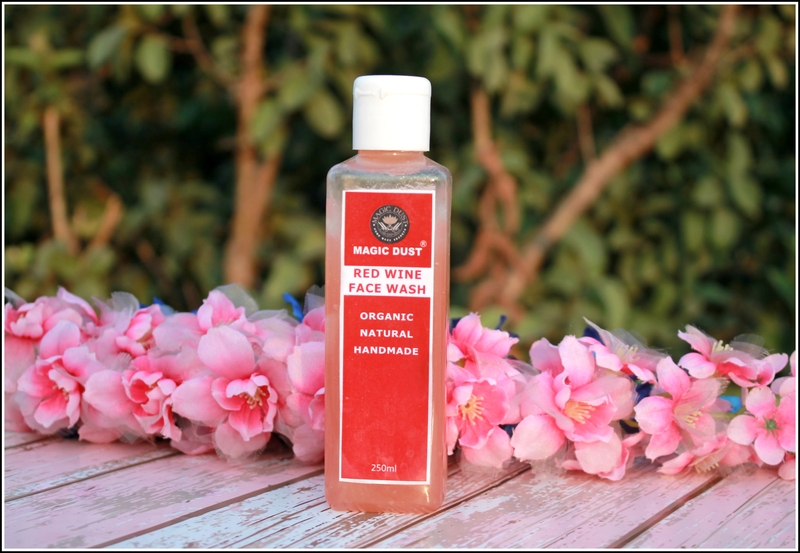 This hydrating face wash by Magic Dust gives your skin a burst of nourishment and gradually reduces fine lines as well as helps improve skin fairness and elasticity. Use this face wash twice a day, once in the morning and once at night. 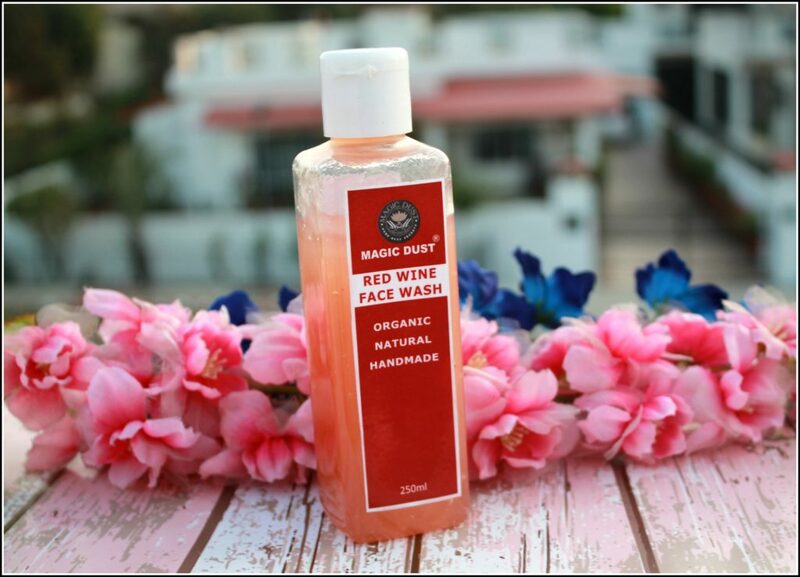 The organic and natural ingredients present in this red wine face wash helps improve firmness and skin elasticity, thereby offering you a youthful look. The exquisite wine extracts also help add a natural glow to your skin, improving its complexion and making you look radiant. Moreover, this mild organic formulation also penetrates deeply into your skin to remove grime and impurities, delaying ageing and making your skin smoother and supple. Lastly, the rapid loss of moisture from your skin due to continuous sun exposure can be easily replenished in just one wash through this organic. You can order the the Magic Dust Red Wine Face directly from their official website HERE. Magic Dust Red Wine Face Wash comes in a white squarish clear plastic bottle with a flip top. The packing is very simple and nothing too fancy about it. The bottle comes with a secure lid so there is no chance of leakage so it is a very travel friendly packaging. 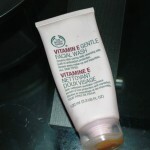 The face wash has a gel like consistency and has a very soothing smell to it. I take a pea size amount of the face wash in my palm, add 2 drops of water and massage it all over my face and neck for 2-3 minutes. The face wash feels very soothing on my skin and the best part about it is that it does not lather like crazy on your face. Once you start massaging it on your face it gets a bit milky but doesn’t lather that much as it is not full of those foaming agents like surfactants. After massaging for 2-3 minutes I wash off my face wash with lukewarm water and my skin feels so squeaky clean post usage. The face wash deep cleans your skin, removes the excess oil, dirt and grime from your face and your face looks so bright, clean and radiant instantly. The best part about this face wash is that it does not dry out your skin at all. I am a dry skin type and usually face wash leaves my skin so dry and parched out but this face wash not only deep cleans my skin but it also hydrates it at the same time because of the presence of sunflower oil and almond oil in it. 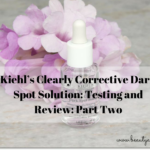 I use it in the morning and at night to cleanse my skin and it does its job perfectly. As for the delaying ageing claims of by the brand I still have to use it for some more time to see that aspect. 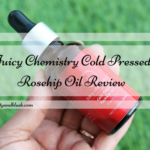 We all know that red wine is great for the skin, it is loaded with antioxidants and it does all the good things to our skin, plus it has aloe vera and fruit extracts which are again very beneficial for our skin so I am all up for this face wash. I know it is pretty expensive for a face wash but it has so many organic ingredients which are expensive so if you guys want to splurge on some skincare I would highly recommend you to buy this one. Plus you only require a pea size amount every time you wash your face so this will easily last you for 3-4 months, I guess so it is pretty economical that wise. I am totally loving this face wash for my dry skin as it deep cleans my skin, hydrates it and also makes it feel so soft and supple post usage. 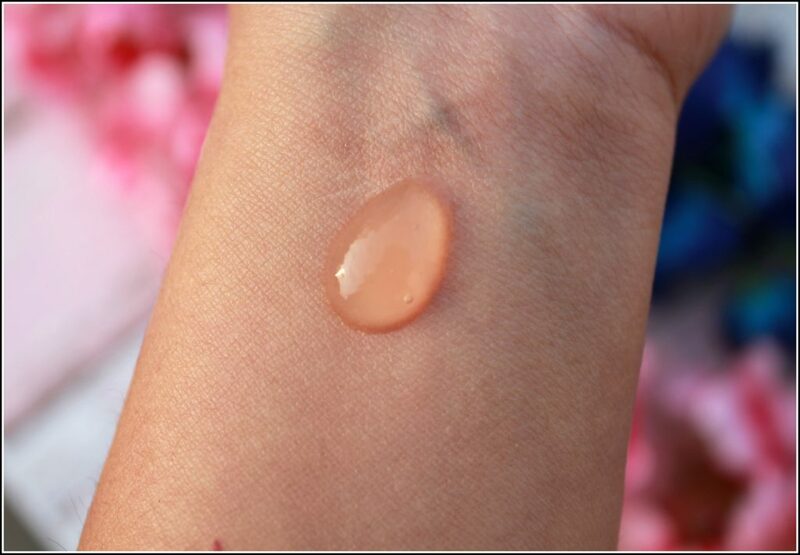 Regular use also helps to make the skin much more clear and radiant. 100% Natural and Organic product. Makes my skin squeaky clean. You require only a little quantity so it will last you for 3-4 months. 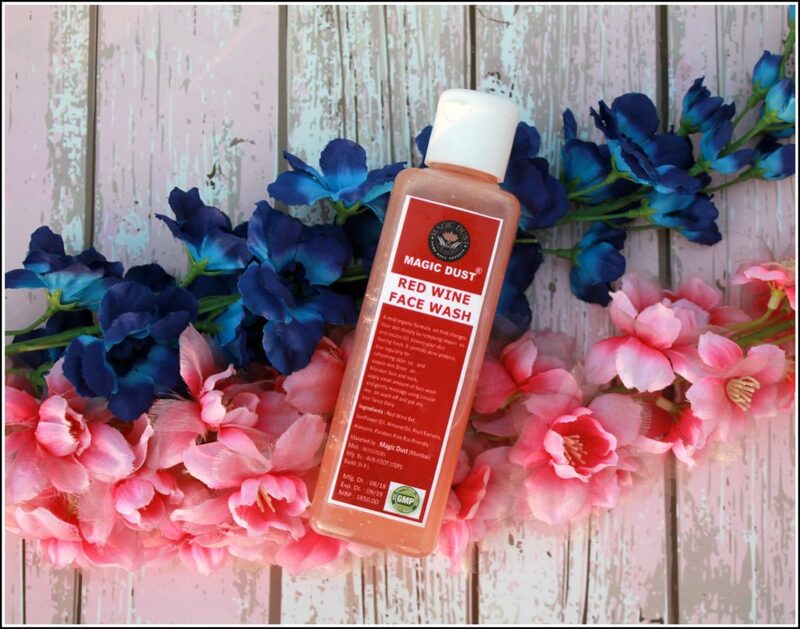 I have reviewed the product in detail above and have almost mentioned every detail about the Magic Dust Red Wine Face Wash. As per my experience, this is a pretty good face wash so if you are looking for something natural, organic which works perfectly and if you don’t mind splurging so much on a face wash go ahead and grab it, you are definitely going to love it.